It took me a few more days to finish the waffle garden, but I finally did it! The first day I tried something a little different, let's call this Digging a Waffle Garden, Method 2. Originally, it took so long to pour water into the dirt and mix back in dry dirt until I had the right consistency for the walls that I knew there had to be a better way. So this time, I took a big pile of dirt that was next to the upcoming waffles and made a basin in it. Then I poured water in a few hours before I'd be able to work on the garden. By the time I came back, a good section of the soil was about the right moisture level for wall making, so I dug out the recessed areas and made the walls in about half the time it took before. I'd definitely recommend this method over the other. As usual, some preparation saves time in the long run. I'd planted and started watering the first four waffles by this point and I noticed already a small wearing away of the walls. I made all the following walls thicker, as a result. The last section of the waffle garden, I tried yet another digging method: Method 3. This was where I finally bit the bullet and tried out Lorrain's method of soaking the entire ground first, then scooping out the waffles and using that dirt to make the walls. Let me just say: DO IT THIS WAY. Method 3 for the win! Dear God that was five times easier. It took just a few minutes to make the walls and the surrounded recessed area. So much easier. These walls were even thicker than the ones before, however. It looks cruder because my time is growing more limited so I had to sort of power garden. The walls might even be too thick, but as I was working on them and noticing the difference, I decided to leave it. Considering this is my first recessed garden, I might as well experiment to see what works best, right? And in the end, this is how my recessed waffle garden turned out! You can see the two green poles on either side - they are marking where the ends of the pipe are. A wall goes straight from one pole to the other, covering this section of the pipe. It made for some interesting shapes in the design that I hadn't been planning on, but that's part of the experiment, too. Since you've already seen the North side up close, here's an upclose shot of the south side. You may notice that these waffles aren't as connected over here. That's because thankfully, I figured one potential mistake out just in time to avoid it: paths! I almost made the entire waffle garden surrounding the inner garden without leaving room to access them all! But I remembered just in time and so left a few dirt paths on the side here - lined with dried grass and mesquite leaves - to access the middle of the garden. 1. Does the shape matter, or are squares just easier? I have squares, quarter circles, small rectangles, and oddly shapes polygons. I should have a good number of shapes to compare. The wider they've become, the more there has been slope from the top to the base, as well. I'm curious to see how erosion will effect these, and if there are any other differences. 3. 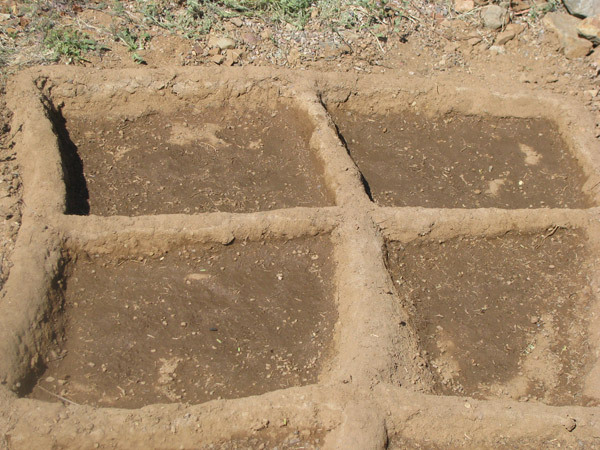 How much does the smoothness of the walls or bottom of the square affect water erosion? I expect a fair amount. In the article on waffle gardens, it mentioned that Lorraine used sand to make very smooth waffle garden areas - I had at first thought that this was for the bottom of the square, but then thought that it might also be for the walls, as well. In either case, the interviewer thought the purpose might be to lower the high spots and raise up the low spots. I could very much see this, yeah. Especially for walls, a smoother wall might present fewer areas that can wear unevenly and eventually compromise the structure of the wall itself. However, there's another possibility that comes to mind after having watered these for a while now: it might prevent the dirt from muddying the water, too. When watering, some of the dirt keeps coming up as silt and then resettling down into the basins. This coats new sprouts and it results in some uneven spots very quickly. With sand as the top layer, perhaps that is less likely to happen. I am considering getting some sand to experiment with and see if this might change things. Another possibility that occurred to me was that it might also help with evaporation. The water would go through the sand layer quite quickly and remain in the dirt, leaving the dry sand on top as a layer to protect the dirt from wind and air evaporation. Yet another reason I'm thinking of collecting some sand and adding it. I'm not certain if I'll do this or not, or if I'll try it next year instead - lots of work to do this year! EDIT: I have found an article from a paleohydrologist which mentions sand being used on top specifically to prevent evaporation, so looks like one of my guesses was right! However, some studies I'm finding on mulching in general seem to indicate that organic mulch is better at retaining water and keeping temperatures lower underground. Then different studies indicate that rock is the best at retaining water, which makes me swing back round again to thinking sand might be great. So, if I have the weeds, I'll likely use them for mulch later, then try sand another time and see what the difference was! 4. How much does the levelness of the recessed bed matter? 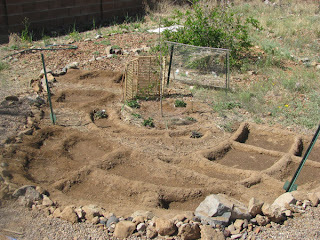 I have some squares that I realized were sloped once I had them planted and was adding more water. However, I have left them sloped to discover first, how much it matters and second, to answer another question: how well do plants other than the three sisters do with this type of watering? The traditional crops like sunflowers, squash, and beans I expect will do fine with this type of watering, where the base of the plant is covered in water for a short period before it soaks in. However, I'm not sure about others plants I'm trying. I've wondered if, watered like this, they may be more prone to mold or fungus. With the sloped beds, one side is getting covered by water significantly less, so if one side of the bed does better for some of these other plants, that'll be useful information! 5. 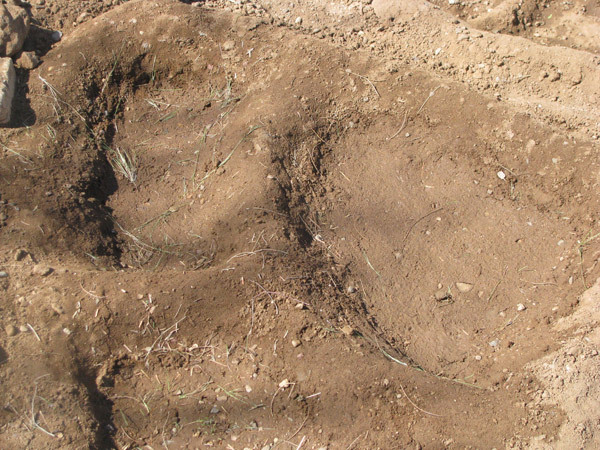 What types of soil amendments will still work well enough to grow crops? 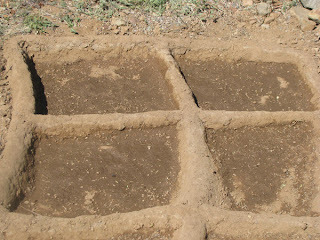 In the first two squares I made, I have compost mixed with desert soil and some rabbit manure that has been sitting in the sun for months...plus probably a little that is fresh, too. For another section of the garden, I have a little less compost and rabbit manure and more dirt - I was running out rapidly. My compost pile is simply not that big yet, or rather, it's not big enough to support all my gardens! For most of the garden, in fact, I didn't have any compost left! I'd mixed the rabbit manure into the compost pile, so I didn't have any of that left, either. But I know that the plants are not going to do well on just the native soil, so I made, hmmm, a sort of bastardized compost by pulling some of the wet and dry grasses in my yard, along with a few small weeds that I don't believe are poisonous. Then for the rest of the waffle garden, I buried these underneath the soil along with a few broken up twigs and such. I just needed enough to keep the dirt from becoming utterly rock hard again, and I'm hoping that will help a little, at least. As seedlings emerge so I know where they are, I'm going to make a kind of jury-rigged compost that I've used in the past. 1. Keep the veggie and fruit waste you would usually put in your garden compost pile. 2. Put them into a blender with an equal amount of water. 3. Blend that stuff up until it's mush. 4. Go out to the garden and pick a few spots near your growing plants to dig a few small holes. You want to keep this a little away from the plant so you don't damage the roots. 5. Dig the holes and pour a little of the veggie sludge in. Cover it back up with dirt, and that's it. You're done. I don't know how well this technique actually works, but so far it hasn't seemed to hurt in the places I've used it. I also very commonly put a few weeds and dried grasses back into the soil of my garden rather than composting them in the compost pile. Again, the few I use don't seem to negatively affect the garden. I've always read that composting material in the garden itself can be problematic, but I suspect that this usually refers to much higher levels of organic material than I'm using. Okay, yeah, so I have no idea. Researching it is on my to-do list, along with dishes, cooking, cleaning, homeschooling, and growing food to eat. It's going to take me a while to get there, I suspect! Thanks for sharing your ongoing project! Amazing work thus far! There is sheet composting, which is to say mulching thickly and letting the material compost in place. The only issue with plants is you have to keep the mulch material an inch or three from touching the base of the plant. Works best for transplanted plants like tomatoes, peppers, etc. 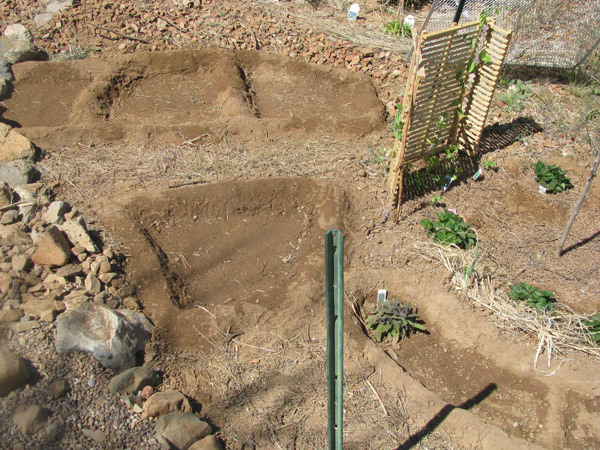 Sloped beds would work for companion planting of different plants with different water saturation needs. Higher areas for plants that require more drainage. Melons and squash usually are planted in hills, while corn are planted in rows. Sand is ok to a point, if you have high clay soil then mixing sand in will help with drainage. However do that for many seasons and your drainage of your soil changes. Mulch materials, however, compost down into organic matter which feed the plants.